EFFORTS HAVE been made to wipe the word “illegal” from the everyday narrative on undocumented immigrants. For a group of mixed-race intellectuals and academics, the word “mulatto” isn’t any better — no less inadequate to address the complexities of modern identity. 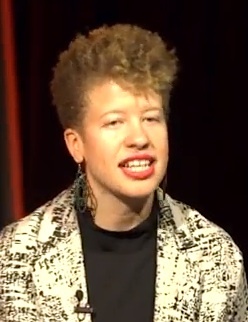 That word and the binary view of race in America were the subjects of “Evoking the Mulatto,” a panel discussion held Thursday night at YouTube Space NY. The panelists evoked their own experiences as mixed-race Americans, addressing the question of what it means to be of mixed heritage in a 21st century nation seduced by the duochromatic convenience of black and white, a legacy of the last two centuries. The discussion itself, sponsored by the National Black Programming Consortium and live-streamed over You Tube, reflected the “Rashomon” aspect of discussing one of the more loaded words in the American racial lexicon. The panelists brought their different viewpoints on this anachronistic misnomer used to describe a growing segment of the American population. “I identify as black and Mexican,” said Judy Pryor-Ramirez, who directs civic engagement for The New School and whose parents are from Texas and Virginia. 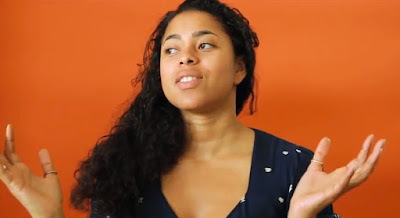 “The word I heard is ‘mulatta,’ an older generational word to describe a mixed-race person. The word that I knew growing up and [which] my mother used to describe us was ‘trigueña,’ a word basically derived from the word ‘trigo,’ which is [Spanish for] wheat. It’s about the coloring of the skin, about the gradations of skin tones that we use in Spanish to describe people. The panel pushed back against the trope of “the tragic mulatto,” a 19th-century stock persona applied to mixed-race persons presumptively assumed to be absent of clear ethnic identities. “For me the issue of the term ‘tragic mulatto’ is more that it’s placed upon us than we place it upon ourselves,” said Lise Funderburg, the author of “Black, White, Other: Biracial Americans Talk About Race and Identity.” “The larger question of how do we have larger conversations about race ... we have to be willing to allow for differences of opinion. 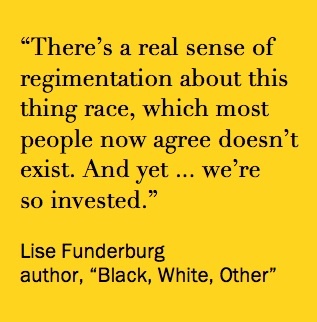 I think there’s a real sense of regimentation about this thing race, which most people now agree doesn’t exist. And yet ... we’re so invested. Carving out a specious distinction between “Twitter the Network” and “Twitter the Company,” Meyer, an associate editor at The Atlantic, asserts that the relative stasis of the microblogging social network, vis-à-vis its stock price and other metrics sacred to Wall Street, has a parallel with Twitter’s diminishing performance as a growing concern in the online space. The marketplace of ideas and the marketplace of money, he seems to say, are of one mind: Twitter may be on its last legs of influence. This active Twitter user begs to differ. Image credit: Twitter logo: © 2015 Twitter Inc.
BY ALMOST any measure, it was a very good week for Paul Davis Ryan, the Wisconsin Republican congressman just elected Speaker of the House. Two B.F. Deals have come to pass in the last eight days, events that could be a promising sign of things to come for anyone hoping for a Congress committed to getting things done on the eve of an election year (when Congress probably won’t get things done). The speaker got an early break. On Oct. 27, a day before the confirming vote, Ryan was set to start his new position with a kind of House-warming gift: the House’s approval of a budget deal that staves off a federal government shutdown and doesn’t end until after next year’s election. The 16-month deal that the Senate approved on Oct. 30 (64-35) sunsets in March 2017. President Obama signed it on Monday. With that divisive, potentially ruinous disaster now off the table until well after the election, Ryan got himself a short-term get-out-of-gridlock card that lets him focus on the other big job that his new congressional role demands: making things happen in the House in a way his predecessor, John Boehner of Ohio, could not. Things got better fast. Fast forward a week. On Thursday the House gave the newly-minted speaker a resounding win when it overwhelmingly (363-64) passed a highway funding bill intended to kick-start mass transit and infrastructure projects for six years. The $339 billion House plan would provide funding for such projects for three of those years; some of that money would come from surplus funds from the Federal Reserve. The Senate passed its own version of the measure, and a conference committee will try to resolve any remaining differences before the current highway funding runs out on Nov. 20, Bloomberg reported Thursday. If, as expected, the details get ironed out, it would lead to the first multi-year transportation law from Congress since 2012. The new Speaker of the House of Representatives has moved into new responsibilities as big as the new office he’s entitled to (if he ever moves out of his digs in the Longworth House Office Building). He still faces an unruly Republican caucus, a White House spoiling for big things in its last 14 months, and a need for real leadership in this transitional period. But Ryan — already making history as the youngest house speaker in about 150 years — begins his tenure well, with two solid legislative victories achieved swiftly without rancor, threats or a drop of blood on the floor. Nice. Let’s see how long this lasts. THAT LAST sentence wasn’t written in the context of a dare. The idea that a Republican-led House could find a way to advance the agendas of the party, the nation and the Obama White House is terra incognita. We haven’t been here before, not like this anyway. With two legislative actions that keep the government moving and start the process that (literally) keeps the country moving, there’s hope that this kind of bipartisan progress keeps happening. Because it won’t be enough for Ryan to sit on his hands for a year and change. 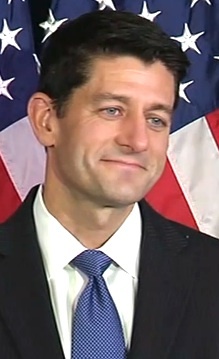 The next 14 months won’t just be the period of twilight of the Obama White House; it’s also a time when Ryan himself will be tested, pushed and provoked as speaker, not least if all by members of his own party ... some of whom thought, and still think, he was the wrong choice. Ryan has his blind spots, none as glaring or as unnecessary as his stand on immigration reform. That much was obvious last weekend on the Sunday-morning talk shows, when the new speaker said he would not be talking to the president about immigration reform. Ryan’s apparent reasoning is that the matter needs revisiting without the white-hot media glare of numerous presidential campaigns. But at the very least, it’s optically problematic. It looks like Ryan’s not just kicking that can down the proverbial road but (legislatively speaking) kicking that can off the road altogether. “The House of Representatives will not vote on comprehensive immigration legislation as long as President Obama is in office,” he wrote Tuesday in USA Today. But that rationale is specious. Faced with a Congress that more or less panoramically refused to move the ball on many major reformative pieces of legislation for years, the Obama White House has since made good use of recess appointments, executive orders and the inattention of his various political opponents. These were the only avenues left open to him to advance the important components of his agenda — one of them being immigration reform. Waiting until after January 2017 to move meaningfully on the issue is to throw away an opportunity to make serious inroads into the Latino vote before the election — an election that, with an estimated 66,000 Latino Americans turning old enough to vote every month, may well turn on that same Latino voting bloc historically alienated by the Republicans at every opportunity. Adopting a gradualist approach to immigration reform, Ryan almost certainly ushers this pivotal demographic into the Democratic fold, and maybe for good. 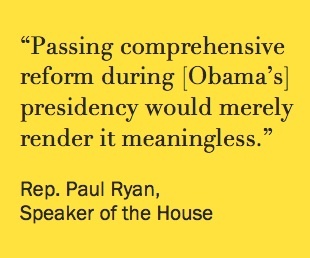 There’s nothing “meaningless” about that. 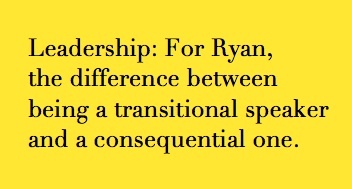 Ryan can break with his predecessor in other ways. His place in the line of presidential succession is important in ways that go beyond his more quotidian role in the House: whip counts or votes or procedural matters. Being in the line of presidential succession presupposes a willingness to pursue at least the optics of statesmanship. If you’re in line to be president, and even if you’re not, you shouldn’t skip encounters with world leaders. Boehner did that between November 2009 and May 2010, when he rebuffed invitations to receptions for Indian Prime Minister Manmohan Singh and Mexican President Felipe Calderon. And later, with no reason offered, he failed to show in January 2011 at a White House state dinner for Chinese president Hu Jintao. It would have been Boehner’s first such formal dinner as House speaker. Never mind the snub of a president he apparently didn’t like or respect much; with the no-shows at the receptions, Boehner lost an opportunity to widen the strike zone on being a national leader. And by missing a state dinner with the leader of only the second largest economy on the planet, he ducked out on one of the more inescapable perceptual responsibilities of the job of Speaker of the House of Representatives. Ryan needs to rise above any such temptations. He is second in line to the presidency for a reason. THE EARLY report card is good for the new speaker. He’s made some of the right gestures, the ones that suggest the possibility of bipartisan accomplishment and a willingness of lawmakers to reach across the aisle (holding their noses if necessary) in order to get something done. And he’s the beneficiary of two potentially monumental hurdles eliminated before the ink was dry on his new stationery. But we can count on it: Like Boehner before him, Ryan will have chances to advance the GOP’s objectives at the expense of the nation’s. Sooner or later, facing the warring factions in the House he now presides over, he’ll be forced to make hard choices — choices that will offer a clear contrast between how Congress “should be doing the people’s business” and how they’ve done that business, or failed to, in the past. Ryan’s actions could make the difference between his speakership being transitional and being consequential. For his party, it’s the difference between standing athwart the future — sighing and wistfully gazing in the rear-view mirror — and looking forward, facing the unyielding, enlivening, emerging demographic realities that neither he nor his party nor our nation can evade. Image credits: Ryan: Bloomberg. U.S. foreign-born forecast chart: © 2015 Pew Research Center.